PS: legit Flex job has changed some what since I reviewed it in 2017. Now they ask you to pay $5 for each worksheet you mail and submit to them. They say they will pay you back this money in your check but I have received many complaints from people who have joined stating that they never got paid. As shown in the image above, Legit flex job is a copy and paste scheme (I will explain this further in the review).This program claims that they will help you make about $371.25 a week working part-time from home. They explain that you will do this by becoming a worksheet processor. I decided to check out the job tittle worksheet processor and found very little convincing evidence that it is a real job. In fact, I had a hard time finding one with a legitimate company. Anyway, legit flex job claims that you will enjoy this simple job because they will give you a startup kit with simple instructions. The kit they say will teach you how to process worksheets for companies. Ok, the word startup kit is a problematic word in the online world because major online scams use this tactic to lure people into their program. So this is a big red flag for this program. They do not say what kind of qualifications are needed to get the job. I expect companies will want you to have at least a certain kind of experience before letting you even see their worksheets (if they exist). Any real job requires some qualifications even if they are basic; except of course this is not a job. It will explain why they want you to pay before you get it. By the way, if you want to learn how to make money online, click here to create your account for free. If Legit flex job academy is anything like many legitimate jobs out there, there should be a job description that list out the dos and don’t of the job; but there are no such documents. According to legit flex jobs academy, to make money you need to complete these worksheets and submit it to them and you can complete as many worksheets as you like. You can work where ever and whenever you want. I know making $371.25 a week is very reasonable and working at your own time from home is very appealing. However, I don’t feel good about this program. They claim that they have generated such a large demand that they need people like you to work for them. Yet when I try to investigate about them, I see no such vibe on the internet about them. If they are such a big deal as they say, it will be easy to find independent testimonials about them; yet it’s not. 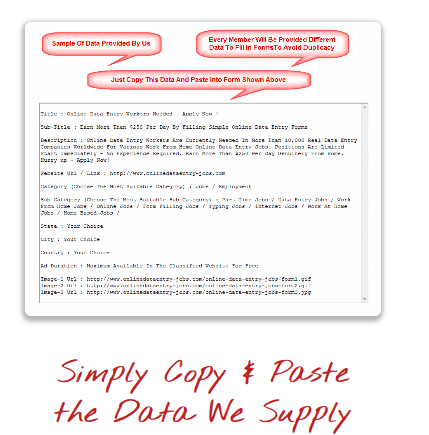 I find it very contradicting when they say you simply have to copy and paste the data we supply. Now which one is it? ; worksheet processing or a copy and paste scheme. If it is a copy and paste scheme, then it is the dirtiest scam technique in the books. Like link posting, copy and paste involves spamming many popular platforms online with links. For this to work and provide revenue, millions of links need to be posted because the click rate for such links are low for good reasons. Some of those links are viruses and people have learned not to click on such links hastily. Some of the link take you to scam sites where you are told fabulous stories and scammed senseless. So, if legit flex job is using you to copy and paste, there is a good chance that they are a scam. I like it when a businesses has a face and name to it. Even though some sketchy businesses use fake names and faces, there should at least be one. Legit flex job makes no mention of an owner and I don’t like it. I can’t say outright whether it is a scam or not but it does smell fishy to me. Especially when I got this sudden bonus when I tried to leave. A pop up alerted me to the bonus and it claimed that I could now pay just $27 instead of $37 to become a member. I know a $37 one time fee is no big deal but if it is a scam, that is not all you will loose. You will waste time and you’ll have given them your personal information too. Anyway, they keep emphasizing about how this is a unique opportunity and it is important to act fast or lose your spot. I don’t like it when online businesses try to pressure people that way. It doesn’t help that they don’t have a free trial period for people to test drive the program. If I were you, I won’t give them my credit card number because I don’t believe in their money back guarantee. If they are so sure their program is that great, they should at least let people test drive it, even if it is just for a day. There are programs on the web like wealthy affiliate and Affilorama that teaches people tons of ways to make money online and they let people test drive their program for as long as they want. I learned how to make money online with them and today I am proud to call myself an online entrepreneur thanks to them. It’s a win win for the program and you when they offer a free trial because you get to see the benefits of what they are offering without feeling pressured to pay right away. On the other hand, if you are looking for a traditional work from home job, where you will be paid for doing something, click here for a list of the top 100 legit work from home jobs. Legit flex job academy maybe legit or a scam; I am not sure which one it is but I am leaning more towards scam. A job like any other should be acquired for free. It is the responsibility of employers to shoulder the cost of hiring someone to work for them. If you have to pay to work then better do it at a place where you can learn to work for yourself. Some visitors to this post have suggested that you can get your money back via clickbank if you don’t like the legit flex job academy program. Thank you for your review. I had the same feeling about the company. It’s good to hear someone else with the same feeling. Some people have been able to get their money back through click bank but since a lot has changed since I wrote this review, I’m not sure what the procedure is. I just sent 25 dollars I’mone order ,so I guess I will conceal the money order and try to get my money back. The experience I had was to print out their forms and write in the name of the person that had more than $500 dollars to reimburse. One page was worth $5.00. You could not send no more than 4 sheets. Also you had to buy the envelops. Vincent, please let us know anything new. Have you heard back yet? How is it progressing? The “work” to be done seems to have changed (it is still copy/paste, but things seem to be different). Other reviews talk about paying a $35 fee, now you send in cash or moneyorder (no more reimbursement from clickbanck). And its no longer ebay-to-amazon, now it is to “help” find possible unclaimed funds beneficiaries (for a different scheme? Accomplice/Accessory?). It’s not hard work, but it is time consuming – most data-entry jobs fall into that category. This COULD be legit. But, then again, it could be BS. You are welcome Ellen. Let me know if I can be of further service to you. You maybe interested in the post work home jobs that are not scams. I had some questions as well and was wondering that as well. Highly motivated! Good! I’m happy to help however I can. Please if you have any more questions, don’t hesitate to ask. I don’t think you will be able to enter any worksheet with my legit flex job academy as I believe this company is a scam. I took out your email to protect your personal information. There are a ton of ways you can make money online. The legitimate ways require hard work and patience. If you want to learn how to make money online, try wealthy affiliate. They have a free starter membership program that will teach you the basics and more. Before even make that statement have you ever done it and if you have then it might have been a copy-cat. There are many what I call “imitations”. and charge the suckers right off the top in fees and a lot of more hidden fees that is not mention in the first video presentation. I am also a victims so many time and a shame to say.I am giving this a try it made sense and all I can say in 10 days from now if this is a real legit job working from home. I will like hear from you in 10 days. Please let us know if you got what you expected from this program. I hope it works out for you. I’m sorry you’ve been through such bad experiences. The thing with online programs it that they usually make it seem like it’s so easy and you will make money fast. Many people do not make money with wealthy affiliate. I blame this on the hype surrounding the program. I’m a member of wealthy affiliate and I’m successful because I took a whole six months just learning. I like their hosting and website package since with the premium membership, I can build more than 20 websites and host them free. I agree with you, online programs can be very depressing. People make look great in video but in reality it’s not that pretty. I hope you find what you’re looking for soon. Let me know if you need help. Thanks for sharing. I too had a gut feeling that this was off the honest path. Nice to see it backed up by others. It’s always good to listen to your gut. Those little subconscious signals it gives us has helped save a lot of people including me from bad situations. Lately, scams have been dropping the hype and using more realistic goals to fool people. Once they get information like credit card and names, they start charging you and selling some of your personal information to others. I’m here to try and help bring some of these schemes to light. At the end of the day however, the final decision belongs to you. I bought the program and instead of sending me to a worksheet job it sent me to 14 videos that taught me how to advertise items from Amazon on E-bay and sell them for a profit. Called Click Bank University. I called Click Bank and they issued a refund. False advertisement at the best! Wow, they have taken their scam to another level. I’m happy you were able to get a refund from click bank. Thanks for sharing your experience Teresa. Hey Denise do you know of any legit work at home jobs? I know you can make some money answering surveys on swagbucks but it’s not going to be a lot. You can list your skills on fiverr and perform service for people who need it. It takes a while to get your first job but many people make good money there. There’s esty and eBay for selling things you make from home or things you buy on sale. There’s affiliated marketing with companies like Amazon, where you help sell the products of others for a fraction of the sale price. You can try wealthy affiliate’s starter membership to learn all about making money from home. I’ve joined the program and received nothing in the mail. How did you get your refund back??? I will advise you to suspend your credit card so they can’t charge you any longer. I don’t know how you can get a refund. Try their cancellation link on their website. I hope you find a solution soon. Personal information – that’s suppose to be hidden on websites. Many companies will sell your name – if you’ve purchased anything – off line or online – this is how you get so many catalogs in the mail. I did get one catalog in the mail and they asked if I wanted extra mail – more catalogs – charging you – their suppose to charge you once. I once was charged 9 times in one day for the same product. I had to call my credit card company and complain. I personally have run into scams but I catch their red flags. They can even send you a check – becareful with those two – my bank caught it. Otherwise I’d owe 2K to the bank. The check wasn’t even deposited – it looked legit but wasn’t. I’m looking for something legit as well. You are right. We’ve all got to be careful. These scammers have a lot of tricks and ways to steal your money. One way to get your refund is to contact Clickbank – most companies you can contact them on social media. Most companies provide a phone number as well. Amazon is hiring but you have to live in a certain state. I was going to work for them for the holiday season but don’t live in the states that are listed. Thanks for your great advice. I just got involved at home job and to make a long story short is don’t know in 10 days from now I will tell more about it. FYI – Update I just received a message back from legitflex – I asked them to contact me. They said your feedback is very valuable to us. Highly motivated to get working again – lots of extra expenses. Ugh! We just went through hurricane Irma too. I’m sorry to hear that Caroline. I hope you resolve your problem with them. Well I gave them (scammers) the better of the doubt if Legit flex Job is not a scam. Only three days ago when I posted a comment on the program of Legit flex job . In 10 days I would let in any interested suckers to join in. In going to check in the member area like I have done more than 10 times is now saying that I do not exist. So I cannot pull up the site and when I click the icons the screen pop up and says that it is an error , check spelling , or may have moved away or change name and so on. It is like they have closed up any way I will investigate more and make a report if it comes to that. I am so mad that I am going to say that deep down in my heart there is a real legit job working from your comfort of your home. Don’t give up. There are legitimate jobs you can do from the comfort of your home. Read the post legit jobs that are not scams for more information. I bought this last week for 37.00 and am not satisfied. I would like a full refund ASAP. I’m sorry to hear that you’ve been a victim of the legit flex jobs scam. You should contact your bank and file a complaint against the company to get your refund back. I do not recommend legit flex jobs at all. If you read through my post, you will see that I recommend wealthy affiliate instead. No Wealthy affiliate does not provide you with things to sell. They teach their members the techniques of affiliate marketing. This is the process where you recommended the products of another for a share of the profit when it is sold through your efforts. Wealthy affiliate also offers web design and hosting to enable their members to build websites like mine right here. I did go to federal account recovery and didn’t find the information you claimed. Federal account recovery is a site that claims to help people recover their lost properties. It will have been more fruitful if you had added a link to this information. More so, you could try to counter my claims as you say with facts to help my readers make an informed concern. I did not have to pay them anything. I just had to install an antivirus app on my phone bc I am dealing with other people’s personal info. They never asked for my card number. Or bank info for direct deposit. Said I would get check in the mail. Never told me I would make a certain amount a week. Told me how to make money based on what I find and process. No copy and paste. It is to print worksheets and fill out in writing and mail in. Independent contractor position, so they say they will send my checks to many address I provided and do not take taxes out. Thanks for your input Jessie. Can you please add the link to the site you are commenting about so other readers can see for themselves. I ask this because many people confuse legit flex jobs with flex jobs. These are two different companies. Hi. I just saw legit flex job academy website and they has no membership or anything like that and they are not even asking for a credit card. They have explained everything to do the work. All what i did it just entered my name and my email address and they give me access to everything, but im still a little worried. I tried a lot websites and they all were scam. Should i try this one? I need help please. If it is really free as they say then you don’t need to worry. You can take the time and browse their website to see if it is what it actually says it is. I know for sure that the name is misleading because there is no job for them to offer you. It is more like a business opportunity where you need to invest in to grow. What you need to find out is what exactly are you going to be doing to make money. If there is any doubts that you can’t clarify then don’t proceed. Regardless, I say proceed with caution. You’re right. They won’t come clean with this information. This plus other things I listed in this post explains why I think it is a scam. If you are talking about the same one that only $5.00 along with a worksheet and the maximum of 4 worksheet and $5.00 for each one that you submit and not going to say more well I just sent to the company 4 worksheet and it got great reviews with very little advertisement and see if any check get mailed out will be 3/20/2018 about that time frame. Wait but it is leading towards a scam. I got curious about that and being a scam victims that these crooks also rob my trust online and searching for a real legit job working from home . I thought it was legit flex job and now I don’t think so because in clicking the links that they sent to me now cannot enter a screen pulls up and says that I enter wrong or mispelled or the have moved or change names and so on. Going to login to the member area now it is stopping me from going in tells me that I do not exist . They have not heard the end of me. Federal Account Recovery 79405 Highway 111 Suite #9 Box 167 La Quinta, California 92253. They list which office you are to send you paperwork to according to the area you are located. You fill out the unclaimed money forms and send 5.00 per form , then email thwm to advise them that you sent out you pages and how much processing fees you included. Mr Harris explains they are having a contest to win a trip and spending money on the trip. So he needs referrals and this is whybi imagining the info for free because he needs referrals and asks you put his name in the forms so he can win the contest. The company will only accept cash and Money Orders. Personal Checks are NOT accepted. Make money orders out to “Federal Account Recovery” (I personally suggest sending cash to save on money order costs like I do). Do you know if this is legitimate or not? It sounds pretty good and I’ve already found a few accounts. I bought a laptop to do this work on and I’m ready to get started. I’d feel more comfortable giving them a check but they don’t accept checks. Has anyone ever worked for this company? I have not watched that particular video so I can’t give you my opinion about it. However, to be on the safe side, ask for a free trial to see if it actually works. Many legit programs offer a free trial and this one should not be different. thanks for your insight; most appreciated. Hi Denise, Like Joy, I am curious about this one, as it was FREE to join. I just found it last night. I find your motivations here admirable, but a BIG question for me is: Why are you writing a REVIEW of something you have NOT reviewed? All you’re putting forth here are OPINIONS, unless you have actually tried the program to determine results. Yes, it may be a scam, and I think you’re right, but at this point, I have not ready ANYONE’S results, on this review page or others. For $5 or $10 it may be worth a try, but the part that concerns me is this: There is no way that EVERYONE who is identified as having unclaimed funds, is going to hire them for 30% Fee, to claim the funds for them. So, how then can they pay YOU the 75% of the Fee for EVERY Submission that you send to them with your $5? I think instead of charging people $37 to “Join”, they may now be getting their money from everyone sending them their Submissions with $5 each. Who knows? I’ve NOT heard any RESULTS from anyone… BTW , my sites are made in Wealthy Affiliate. The one listed is brand new and I’m in the process of building it. This scheme keeps changing. When I reviewed it, it was charging $37 but apparently it doesn’t anymore. It is a smart why on their part to cast doubts in the minds of people reading this review. You’re right that I have given my opinion in this review. It is based on my short experience with them. I didn’t make any money and I made my conclusion quickly since I had come across similar schemes online. Sadly, I feel for this and actually paid the $37 which didn’t seem like a lot of money. I sent in these so called worksheets and spent about $60 to do that. I never heard anything back so I thought “okay, I will log in and do a few more and see if I get a return on those”. Well, I tried to pull up the page to log in and suddenly it doesn’t work. I feel like I did get screwed in a way but so far all efforts to recover my money have gotten me nowhere. I will never fall for one of these again. I am sure there are legitimate ones out there but this has put a little bit of tarnish of them because of scams like this. I am sorry this bad experience has left you discouraged. There are legit programs out there. Many of them offer a free trial period. Before joining a program, try it first for free to see if it will work for you. Most online programs will take some time before it can start making money so don’t fall for those that promise you over night riches. The thing that they are talking about its mycashflowsecrets.com. tevor Harris states u can search two data bases for unclaimed properties and earn 75% of the 30% finders fee. Send cash or money order but cash is the best 5.00 per worksheet with given mailing addresses to the federal account recovery. I saw this n it piqued my interest..however i do look into things. An internet search of those addresses will give u a makeshit website. If this is a federal establishment it would have more informarion on this building. Secondly…if u google map the address…western one in particular. It cannot find the name but the address pinpoints to a ups storefront in a shopping mall. If anyone asks u to send cash…ever..ever…do ur research. The videos clearly tell u that no checks only cash n money orders and does give u a recepient name for the money order..so u are blindly sending cash to an unknown place. Thanks for this great information. Hopefully, it will help others stay out of trouble. The Bank of Canada is aware of organizations, seemingly based in the United States, claiming to offer work opportunities to settle unclaimed balances on behalf of the Bank of Canada. Please be advised that the Bank of Canada does not have any connection to these organizations, nor do we encourage or regulate third party businesses in matters of unclaimed balances. You should not send any money to the Bank of Canada or organizations claiming to be affiliated to the Bank of Canada; the unclaimed balances registry is available free of charge on our website. The information displayed in the search results reflects the balance information exactly as it was received from the originating financial institution. Some information may appear without accents. It is really sad how these scams keep reappearing with different names. You are right Valerie, something needs to be done to make this kind of scam less common. What we do is just a drop in an ocean but I think it’s a start. I am sending this message today 7/9/18 ,Yes, I fully agree Denise to File a Complaint with the Federal Trade Commission, ,because as long as they think they can get away with it they will keep doing it.I am sending to you all today 7/9/18 this message, http://www.legitflexjobs.com/login and http://www.mycashflowsecret.com it is a scam I joined 1/4/18 and never got paid. And Bank of Canada and Naupa was the 2 links of the website in the http://www.legitflexjobs.com/login Trevor Harris he got caught, he was not Affiliated with Bank of Canada. He remove the link out of the account portal so you would not know. And he changed the website to http://www.mycashflowsecret.com. If you want to file a complaint. You can call the Federal Trade Commission they get Internet Scammers the phone number is 1-877-382-4357 to File a Complaint over the phone or you File a Complaint online at http://www.Ftc.gov. And make sure you get a Reference number and keep it for any documents you will need to mail in proof of what you did money orders, worksheets and whatever else. The address is 600 Pennsylvania Avenue N.W Washington DC, 20024, you would put Attn: CRC at the top. And it is time to stand up, because the scammers will keep thinking they can take your money and get away with it.